This is one of my favorite-named plants. Footsteps of spring (Sanicula arctopoides) is a colorful, low-growing little plant that begins to bloom quite early in the season. As its brilliant yellow-and-green mounds spread across the warming landscape, it is easy to whimsically imagine them as footsteps left by this gracious season. 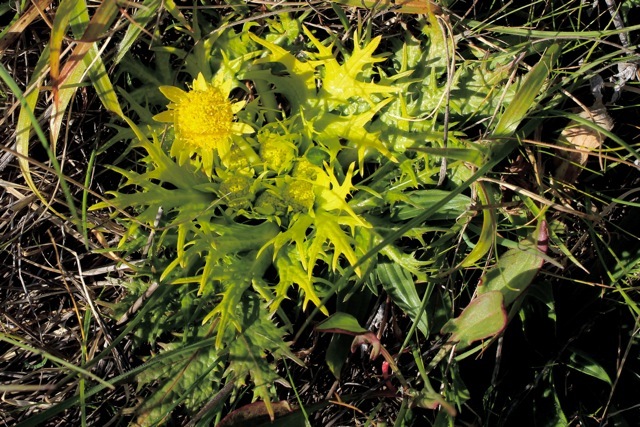 The entire plant is saturated in color, with the leaves ranging from brilliant green at the edges into yellow toward the center. The buttonlike pad of yellow flowers is surrounded by a long fringe of yellow bracts. The whole thing has the look of a lovely, wild, painterly creation. Hurray for spring!